I've written about Randall Garrett's Lord Darcy series before, but I like these stories well enough that I think it worth doing another post on them, this time dedicated to "A Case of Identity," which first appeared in the September 1964 issue of Analog. As I explained in my previous post, the Lord Darcy stories are, among many other things, homages to Sir Arthur Conan Doyle's tales of Sherlock Holmes, albeit homages set in an alternate universe where magic works along scientific lines and has thus resulted in a very alternate 20th century -- one where an Anglo-French Empire ruled by the Plantagenet dynasty is the world's greatest power. Admirers of Doyle's works will no doubt remember that "A Case of Identity" is also the name of a Holmes mystery published in 1891. Other than the title, the similarities between the two stories are superficial, relating to the fact that, in each case, the detective protagonist is attempting to determine the whereabouts of a missing person. In Garrett's story, finding the missing person is of such importance that Lord Darcy, chief investigator to Richard the duke of Normandy, is summoned to a meeting in which he is introduced to the Bishop of Guernsey and Sark, the elder brother of the Marquis of Cherbourg. The four men settled themselves, and the Bishop began his story. "My brother the Marquis," he said after a deep breath, "is missing." Lord Darcy raised an eyebrow. Normally, if one of His Majesty's Governors turned up missing, there would be a hue and cry from one end of the Empire to the other—from Duncansby Head in Scotland to the southernmost tip of Gascony—from the German border on the east to New England and New France, across the Atlantic. If my lord the Bishop of Guernsey and Sark wanted it kept quiet, then there was—there had better be!—a good reason. Darcy's instincts are indeed correct, as he soon discovers. The Bishop fiddled a bit more with his pectoral cross, then plunged into his story. Three days before, on the tenth of January, the Bishop's sister-in-law, Elaine, Marquise de Cherbourg, had sent a servant by boat to St. Peter Port, Guernsey, the site of the Cathedral Church of the Diocese of Guernsey and Sark. The sealed message which he was handed informed My Lord Bishop that his brother the Marquis had been missing since the evening of the eighth. Contrary to his custom, My Lord Marquis had not notified My Lady Marquise of any intention to leave the castle. Indeed, he implied that he had intended to retire when he had finished with certain Government papers. No one had seen him since he entered his study. My lady of Cherbourg had not missed him until next morning, when she found that his bed had not been slept in. It is those "Government papers" that make this mystery potentially problematic, as the missing Marquis had been working agents of the King-Emperor in tracking down a ring of Polish agents provocateurs operating within his domain. In the alternate universe of Lord Darcy's tales, Poland is the Anglo-French Empire's main rival for world supremacy, employing a large number of spies and hidden operatives to achieve by stealth what it cannot achieve through either diplomacy or outright conquest. A significant number of the Lord Darcy stories revolve around the Empire's rivalry with Poland, which gives them a "James Bond-ish" quality (or perhaps something similar to the World War II era Sherlock Holmes films like Sherlock Holmes and the Voice of Terror, where Holmes and Watson battle Nazis). 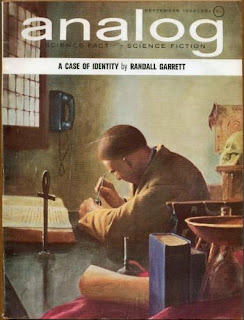 "A Case of Identity" is not the best Lord Darcy story by any means, but I have a fondness for it because Garrett makes good use of the scientific magic of his alternate universe to present -- and solve -- a conundrum. There are, however, large digressions into the history and politics of the setting, digressions that, in truth, bog the story down, but, speaking as someone who enjoys the world Garrett has created, I don't find them as tedious as some might. Ultimately, I think "A Case of Identity" is most interesting as an example of clever world building rather than of clever drama or characterization. I recommend it wholeheartedly on that basis alone; I hope others might be able to look past its flaws to appreciate the magnificent world Randall Garrett has created. One of the first things I did when I got an e-reader was grab the Lord Darcy e-Omnibus from Baen. $4 for all the stories plus the only novel. And I'm not so sure he's based on Holmes. I've seen these stories get dismissed as just a fantasy version of Holmes, but I don't see the similarities, really. I would actually say he's closer to R. Austin Freeman's Dr. Thorndyke. While largely forgotten today, he was the first author that focused on analyzing crime scene evidence with science, as opposed to Holmes (or Poe's Dupin before him) pure fanciful deduction. The first time I saw a Lord Darcy story was in Asimov's magazine. I was lucky enough to get a book club edition that compiled a bunch (or all) of these stories together. I enjoyed the setting and the use of magic, but there is a certain ho-humness about the writing that do bog it down. Yes, still well worth reading and a setting worth exploring for an RPG, but hopefully they can be acquired cheaply or sampled first. Don't forget about Darcy's cousin, the Marquis de London, and the Marquis' assistant, Lord Bontriomphe. I've always enjoyed the Lord Darcy stories. Great stories. I enjoy the digressions into world background, myself, but then I'm a history-nut who practically swoons over the Council of Elrond chapter in LotR. ;-) I wish Garrett had written more of these. BTW, espionage and Great Power rivalry figure in a few of the original Holmes stories, too. "The Bruce-Partington Plans" involves an Austrian spy, "The Naval Treaty" deals with stolen diplomatic papers, and "The Second Stain" centers around the death of a French "free" agent. There may be a couple of others I'm forgetting. I discovered lord darcy around 1984 reading the Ipswich Phial, I've been a great fan since then. I think Lord Darcy is a mix and match of fictional characters. At some point he uses the name 'James Le lien' or some such. James Le lien can be translated from french as James Bond.